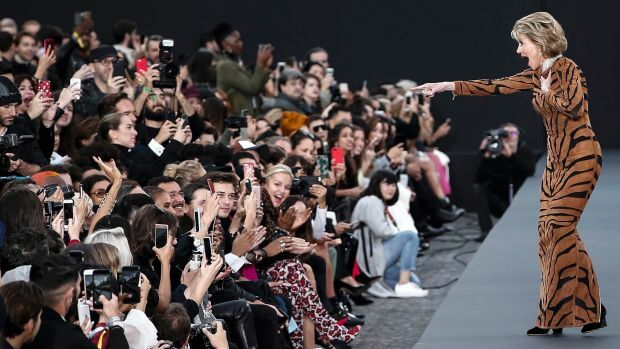 Helen Mirren and Jane Fonda have hit the runway at Paris Fashion Week. The actresses (aged 72 and 79, respectively) were the stars of the L’Oreal show on the Champs-Élysées on Sunday. The show was a first for the beauty brand, showcasing over 70 hair and makeup looks on some of their celebrity ambassadors. Both actresses have a history with the French beauty brand. Fonda has previously fronted L’Oreal’s 2014 campaign for its Collection Exclusive Pure Red lipstick, while Mirren recently made headlines in her capacity as a L’Oreal ambassador when she criticised the beauty industry for promoting skin products “using pictures of 15- and 16-year-old girls” and conceded that moisturiser “probably does f— all” during a panel at the Cannes Film Festival in February. But Mirren was all smiles on Sunday, walking down the runway in a pair of wide-legged grey pleated pants and carrying a black cane. Fonda made her entrance in a slim-fit, leopard print dress. Taking a degree of creative license with her walk, she pointed at fans and gave the peace sign to photographers while a remix of The Chainsmokers’ Paris played in the background. The women were joined by fellow L’Oreal models Doutzen Kroes and Irina Shayk.